Use code IDODECLAIRE for 20% of your purchase at White Plum through July 15! I've been wanting more maxi dresses, especially those with sleeves. Earlier this spring I saw a similar style dress on a friend and fell in love with the wrap style, too. You can imagine how excited I was when this arrived in the mail from White Plum. This dress is beyond gorgeous in person and so incredibly comfortable! They have several dresses similar to this style on their site but the color and pattern on this one really caught my eye. I am such a sucker for blue and it sets of the orange paisley print so nicely. The length is perfect, too. Even wearing my flattest sandals, it barely brushes the ground. I am looking forward to wearing this through summer and into fall! White Plum is offering a generous $50 shop credit giveaway to their store so make sure you enter in the rafflecopter below! With their reasonable prices you could get several items! And even if you don't win, you can use code IDODECLAIRE for 20% off your purchase! What would you buy? I was provided with this and another dress in exchange for my review. All opinions are my own. Laura you look stunning! 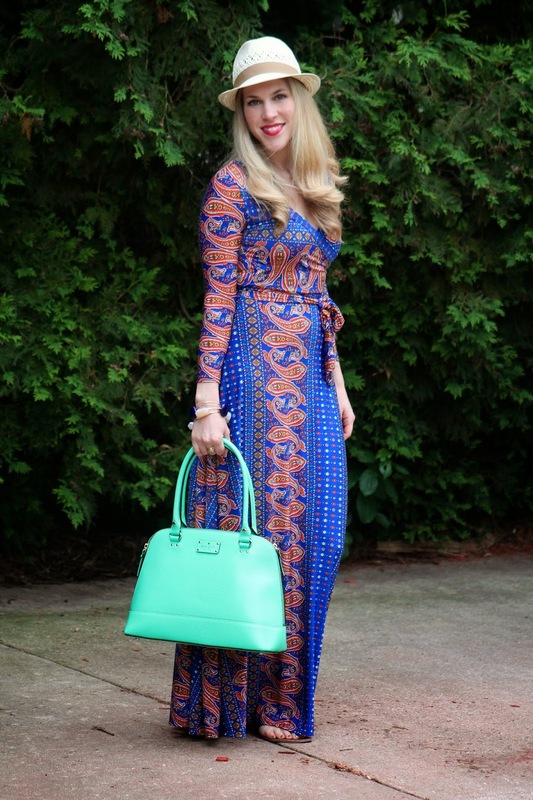 I love the cut and print on this maxi. The color is gorgeous on you! this dress is AMAZING!!! Love it!! That dress is STUNNING and you look gorgeous. This dress looks great on you! Love the colors and that it has sleeves! Amazing dress! You look GORG!!!! You are rocking that maxi dress. Love how you paired the hat with it to. Um, this dress is awesome! I love maxi dresses but I feel like I am always stuck wearing a cardigan over them if I wear them to work since most are spaghetti straps. I love the long sleeves on this one! What a fabulous dress! You look stellar! Thanks for the giveaway opportunity! I hope I win, White Plum has some really great options! They really do! And there are some great sales going on right now! Very nice. I like the multiple patterns going on. That dress is gorgeous! I love that it is long AND a wrap dress! You look lovely! I have been hunting for longer sleeved maxi dresses all summer, and have not yet found one I like. Yes! Spaghetti straps or straps! And I like wearing a normal bra, so this dress is perfect for me! I've not heard of white plum before! I love the crazy pattern and colours to your dress. You suit the warmness of it! That dress is totally gorgeous on you! You look fantastic in the dress- wow! I love the print...and I've never seen a wrap maxi dress with long sleeves...I kinda love it! Such a great dress! Love the print and that it has sleeves! This will be such a versatile piece to wear into fall! You look great in that pretty dress! I love White Plum.They have so many beautiful items and the prices are amazing.So many things I would LOVE from there.The Sage Garden Skirt and the Pink Lace Palazzo Pants are two of my favorites. Thanks Dana! They really do have lots of nice items! I love the Sage Garden Skirt, too! What a striking maxi dress! The longer sleeves are such a nice feature, such a rarity. This dress is beautiful. So eye-catching and sophisticated. 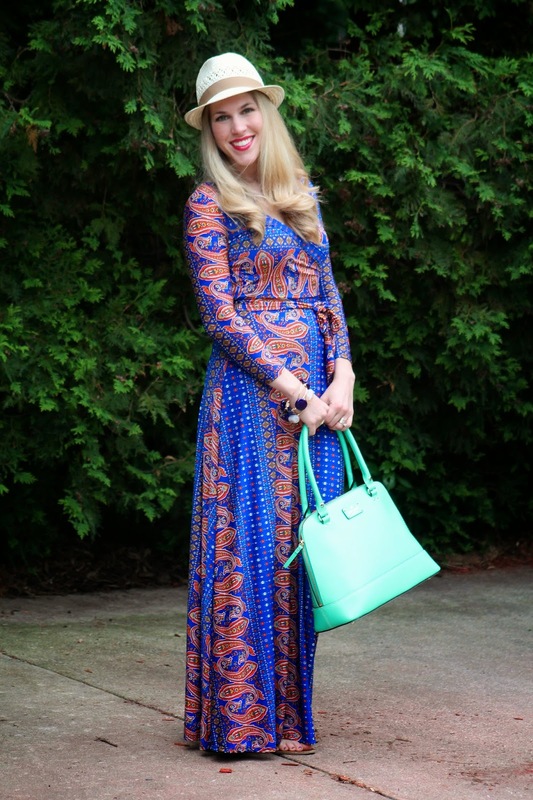 A long sleeve maxi would have initially made me a bit nervous but you've worn it well!